Have you ever gotten that feeling of your gout getting worse after you might have finished eating a particular food? Well, there is a particular answer to that and a better explanation too. Read on, as you get to see some foods that causes or can worsen your gout. There first thing you should get at the back of your head is that your gout does not get worse after eating any kind of food. There are specific foods that have the ability to worsen gout. So the big question will be; "what foods causes gout attack?" For you to have a better understanding, let me give a brief explanation of what gout is all about. Gout is a form or arthritis caused by high uric acid levels in the blood stream. The uric acid then form a build-up around the joints which can cause swelling and inflammation. Biochemically, the breakdown of purines leads to the formation of uric acid. 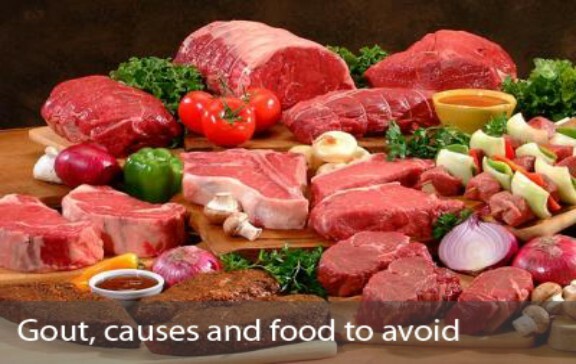 So to be on a safe side, you should avoid foods that contains high amounts of purines. Foods like liver, spinach, mussels, anchoives, beef, asparagus, and brewer's yeast should be completely avoided in your diet. They are all high in purines and you should stay far away from them. We all agree that protein-containing foods are healthy for humans, but you should cut down on their consumption once you are having a gout attack. When proteins are digested, they also end up as uric acid, therefore it is best to reduce the consumption of foods like fish, poultry, eggs and red meat. Avoid refined or processed carbs like pasta, cookies, and bread. An overload of carbohydrates in the body can cause an increase in your uric acid level. Many people are yet to realise that alcohol is one of the biggest causes of gout attacks. The reason for this is because alcohol prevents uric acid from been flushed out of the body. If you notice you do experience frequent gout attacks, then it is high time you cut down your alcohol intake and substitute it for water instead. Removing these top four gout causative foods from your diet will reduce your chances of getting a gout attack. Hope this information is useful to you? Then if it is, you might consider sharing it with your friends and colleagues as well. Use the social share buttons below to share with your friends on Facebook, Twitter etc.